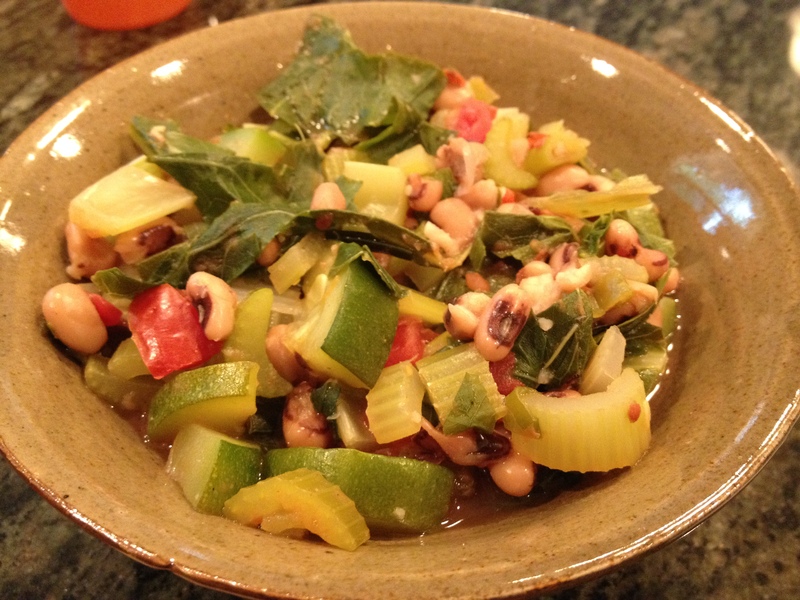 I had a can of black eyed peas, so I immediately thought collard greens. I’ve never cooked collard greens before, but I thought if I combined them with ingredients and flavors that I knew I could come up with something delicious. No only is this stew super easy to make, it’s also loaded with nutrients. The stew is light and bright enough for a lunch, or would pair perfectly with wild rice for dinner. Next time I might try adding sweet potatoes to the stew to give it even more of a southern flair. Preheat the oil on medium heat in a medium-sized pot. Add celery, green onion, zucchini and collard greens. Season well with salt and pepper. Cook about 4-5 minutes or until the vegetables start to get tender. Stir in the black eyed peas, tomatoes, marjoram and parsley, and continue to cook another 5 minutes. Then add the red wine vinegar and reduce heat to simmer. Simmer at least 20 minutes to give the stew enough time to come together.